Parents have many other things to do with their kids to push them to happy and fulfilled lives. Having fun is the most important thing in kids. If you are more concerned about your kids’ growth, keep them on exploring a fun and accompany them to experience cultures. Exposure to different places and their cultures can make your kids more creative in their lives. So don’t think, get ready to have a wonderful family holiday. Morocco has a lot to give you in this regard. Holidays in Morocco have inclusivity in what it offers, she has different weathers, beaches, a wide view of its culture and the very friendly and pleasant ambiance. In Marrakech, there are two small fun parks for children under 12; Ludipark and Paloozaland. In Ludipark the most interesting thing for kids would be the aquapark with colorful slides and safe swimming pool. Other than that there is a Mini Zoo, and a wonderful experience of Pony rides, remember that’s different from the long distant horse trekking. Large castles are there preserving the history of the region, that can be a knowledgeable tour for the kids. Kids must have watched dinosaurs in movies and cartoons, but not in real; Marrakech has dinosaurs themed Palooza land for them. Not only dinosaurs, but kids would also find many different rides, Cinema and Swimming pool there. Kids have a fear of trying new things and that must have a bad impact on their personalities eventually. To put resilience in their lives, they should go through the tough times. Moving to different places can help in making resilience in your kids. Camel ride is not such tough though, but try to sit with your kid to make sure the safety. Marrakech is not a Desert but you can still ride a camel here. You can find very easy to ask any of the locals about where the camels and ponies that children can ride. It is not so costly, but you should have good haggling skills all along the trip to Morocco. What about Bowling and kart race? Other than the Video games and other non-physical activities, bowling is much healthier for the kids. In growing age, Muscles of the human body are also in constant growing phase. Bowling and other physical games can help strengthen their muscles. You can easily find bowling spots in town. It would be great fun during your holidays in Morocco. Kart race is the other best activity for kids in Marrakech, but for the older kids and adults. One of the spots is Marrakech Kart Racing just next to al-Mazar shopping center. One more thing to think about when planning holidays in Morocco is the foods and culture they preserve. The best time to experience those times is to visit Morocco in eventful months like Ramadan or cultural exhibitions. In foods, lamb tagine is a famous cultural dish you can try when in Morocco. Its history would interest your kids. The tagine dates back Islamic empire or Some say the Roman Empire. Moroccan influences over the years are what really makes the tagine unique. Recipes have evolved and many spices have been introduced to Moroccan culture. There are countless dishes you can taste in your Holidays in Morocco. For exploring the Moroccan Culture, you must have a visit to the places where art is preserved. Art helps children grow and develop and build lifelong skills. Children learn from making their own art—and from experiencing the work of other artists—the importance of focus, experimentation, taking risks, and making mistakes. You can wander the medina streets in search of architectural street art. Berber Cultural Centre is such an interesting place to visit. It is located in the village of Imintanoute, some families there aims by this to bring the Berber way of life to the culture of present Morocco. I recommend you to experience living like Berbers, that would be very knowledgeable fun. Modern Morocco when gives a mix impact of imperial Morocco, it attracts the visitors most. For kids while holidays in Morocco, it would be more interesting to visit Rabat, the capital of Morocco. Rabat has several interesting historical attractions, such as the Kasbah of the Oudaias, the old medina, and the Hassan Tower. The gleaming Royal Mausoleum is also well worth a visit. That’s the toughest of your tour to Morocco. It takes 12 hours from Marrakech to reach the Sahara Desert. Riding on Camel in Marrakech and living in Desert is quite different and difficult. If you think your children can make all this effort to travel 12 hard hours and can live in tents, you should plan for the desert. Otherwise, it is advisable to change your plan to some other place. You’ll have to be prepared with the technology free ideas because your electronic would die. This can be an amazing experience, or a really trying one! did you know Fez has the largest car-free medina in the world? Pottery and Drum shops are there to interest your kids. Berberic designed drums are made in Fez. If you want to shop for pottery or leather goods, there are several shops in the same area. 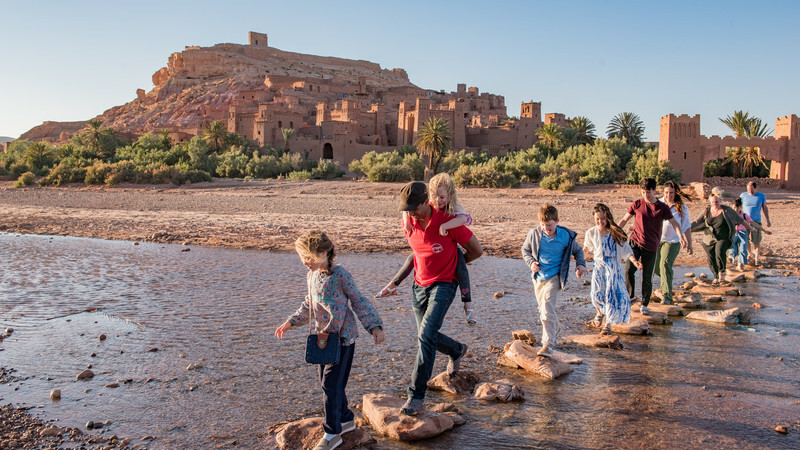 The best season to visit Morocco with family and kids is spring, March, April, or fall, October, November. The favorable time you can spend in Morocco in November and October. Because Summers is somehow troublesome with family. For some, visiting Morocco in Ramadan is not suitable, or on any eventful occasion. It is best for those to plan the trip accordingly.